I don’t think I’ll get into too much trouble if I share with just a few of you that DW (Dee) isn’t much of a cook, and doesn’t have any yen to become one. And so we eat out a fair amount, and our meals that we do have at home are usually somewhat pre-prepared and all we have to do is warm the components, make a salad and we’re ready to eat. 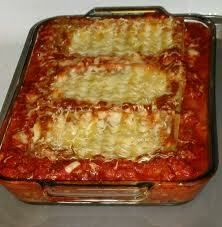 Dee does make an awesome lasagna — one that we’ve served to loads of friends. And even Italians have been known to go for two and three servings of it. I too enjoy her lasagna, and I welcome her to make it for company meals. Note: I’m considered the better cook in the family but my only real claim to fame is original barbecued pork ribs. They are from a recipe developed from a combination of ribs tasted and enjoyed in Missouri, Texas and Kansas. Unfortunately, there are a great number of Catholics who have developed the ‘what are you hungry for?’ mentality about their liturgical worship of God. What do you want this week? This month? While his words are centered around those among us who focus on material things that satisfy – I’ve heard of and met so many people who focus on what they want and need rather than what it is they are participating in. In no way do I reduce to insignificance the music or the preaching or the distractions which we may experience in one place of worship over another. In some cases, these need to be ignored or carried as a cross rather than being a reason for the nearest exit sign. God is with us through all of the ups and downs of our lives. He put up with the absolute worst of humanity so He could conquer it all and come out on the other side of the resurrection in joy. 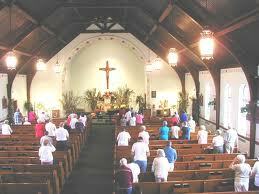 His only way of being with us as Church was to let human beings run it and do their best to guide it and us. Sometimes they fail. Sometimes it’s not pretty at all. Well that same God is imparting Himself to and for us in the liturgy that we go to and that we participate in. When the priest is a sinner, God is there. When your neighbor is a hypocrite, God is there. When there’s a baby being a baby near to you… when you have a hangover…. when the single woman vocalist sounds like Edith Bunker… God is there. He’s imparting Himself to you. The challenge is: let go and let God. In this, you will be fed.